Can this cutaway electro-acoustic perform? Capable all-rounder whose brand appeal ultimately outstrips the guitar's performance: not for traditionalists. Good plugged-in performance. Easy playability. Great neck. Easy tone. Unbound top. Rudimentary general feel. Limited dynamic headroom. Yep, lots of letters and numbers: D is 'Dreadnought'; C means 'cutaway'; PA means 'Performing Artist' series; 5 means the fifth tier (1 being the highest, most expensive); and, finally, K means koa back and sides. Got that? Then you'll be able to work out the dreadnought's code, too. Of course, it's not solid koa wood at this price. No, the '5'-tier Performing Artist series guitars use HPL (high pressure laminates) with a koa-pattern top layer to make it look pretty. The material has been used in Martin models for well over a decade - 1998's DXM was the first - and has been accepted as a reliable, environmentally aware alternative to solid and laminated woods. Atop the HPL is an unbound solid spruce top. Viewed with traditionalist eyes, it jars worse than John Wayne in a shellsuit. Widen your view, however, and there's no absolute reason why acoustic guitars have to have bound tops; a music-obsessed teenager cares about as much for classy binding and purfling as they do personal and domestic hygiene. "The neck features the Performing Artist (hence the name) profile, which in the hand feels roomy"
With little or no finish, it's going to damage it quickly, however, both in terms of chunks out of the edge and picking/strumming marks on the top. More serious, the top of the dreadnought is actually starting to come away minutely from the body - do check carefully if you're thinking of buying one. The PA5K uses a Stratabond neck (with brown stripes) joined with the 'A' block, mortise and tenon, and with a hybrid 'A'/ scalloped X-brace pattern underneath the top. Back to the neck, it's the Performing Artist (hence the name) profile, which in the hand feels roomy. The nut is fairly wide at 44.5mm (1.75 inches), which translates to an impression of more wood in the palm, too. A moderately high action enables you to dig in quite hard. It might be a tiny aesthetic point, but we really like that sharp headstock angle, too. Electrics here are via Fishman's F1 Analog system. Two classy looking knobs and an LED screen give you access to volume, tone, a phase option and, most usefully, an onboard automatic chromatic tuner: neat and practical. Immediately, the PA5 lacks depth. And by depth, we don't mean bass; we mean a richness and timbre of notes and chords. Instead, we have a pleasing spread of bass and treble - what it lacks in punch and authority, it makes up for in a sound and response that doesn't require you to work too hard as a player. 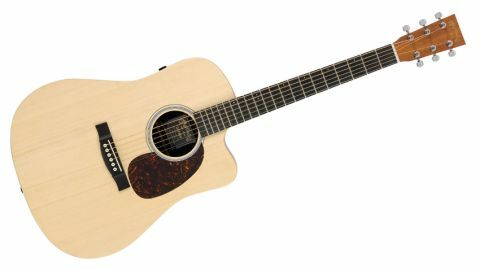 "It's a dreadnought that sounds somewhat 'hi-fi' and would sit well in a layered recording"
In that respect, a top-end all-solid-wood guitar is often more demanding of your commitment and technique to get the best from it. So we have an interesting paradox: the lighter you play this guitar, the more it sounds like a traditional Martin. Start to dig in with some serious picking/strumming hand force, and the construction and material choices limit the headroom and tonal range. It's a dreadnought that sounds somewhat 'hi-fi'; it'd sit well in a layered recording, but you'd have trouble punching out of an acoustic ensemble. Plugged in is where this guitar makes much more sense. The lack of pure acoustic richness and timbre means fewer troublesome frequencies to feed back, as Fishman's F1 Analog does a good job via the jack output. It's worth taking a moment to feel happy about how much onboard preamps have improved in recent years: more discreet in design, much less confusion for players, and better sounding to boot. It still has that piezo sound, but nowhere near as harsh as more rudimentary systems. This PA5 guitar favours a light touch acoustically, but its plugged-in performance and sensible level of onboard control is stronger. We really like the Stratabond neck, too - super solid, with great feel and effortless playability. Martin is already a byword for quality, traditional acoustic guitars. If those are your bag, the spec choice here will seem like sacrilege. Generations of new players, however, couldn't care less about all that and it's to them that this guitar will appeal. Hand on heart, we're left unmoved, but there's nothing stopping anyone making meaningful music with this instrument - just look at Ed Sheeran with his LXM!